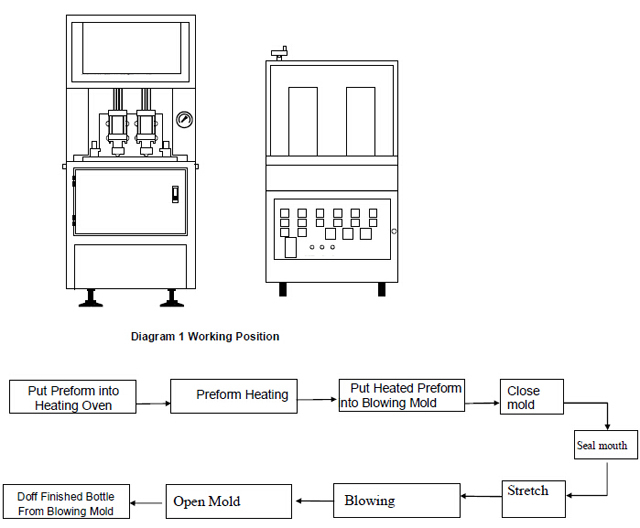 Stretch-blow Molding machine is newly designed and reformed on previous experiences of our manufacture (with great development on the aspect of 2-in-1 cylinder structure, new model mold-clocked set and automatic voltage-regulating set of temperature controller of reheating unit). The mechanical structure is reasonable and compact with small volume, lightweight and artistic shape. 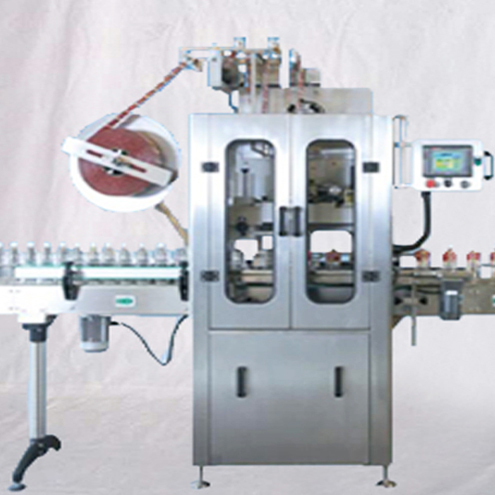 Controlled by reliable electrical and pneumatic systems, the machine runs steadily with low noise and very convenient to be operated. 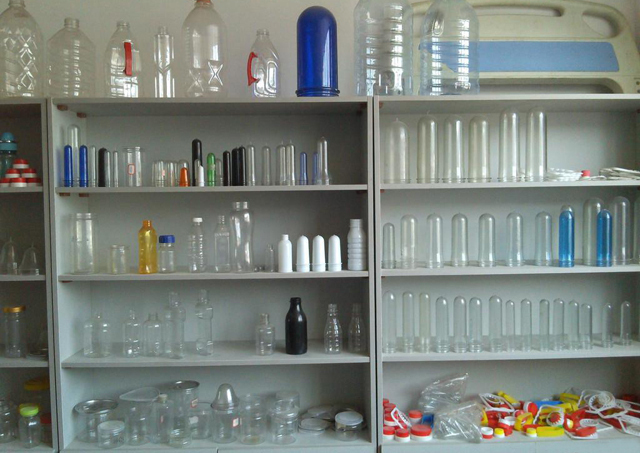 It is an ideal equipment to make different-shaped containers, such as mineral water bottles, beverage bottles, cosmetics bottles, medicine bottles, pesticide bottles, edible-oil bottles, wine bottles and milk bottles, which have passed the test given by the Packing Material Development and Inspection Center of China Medicine Authority. With less investment and high efficiency, it does help you raise production and save energy. Besides, it accords with demands of hygienic food. 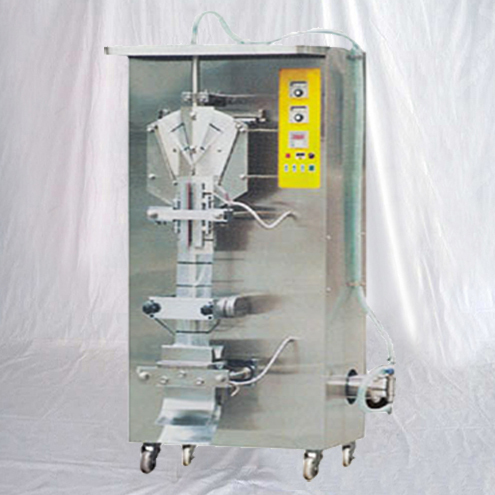 YX-BL02 equips with an infrared type rotary-reheating unit to heat preform. In the unit, we adopt far infrared heating lamps to heat the preform from both sides. The preform will be placed on the circulating discs of the heater. Along with the disc’s rotation and revolution, the preform will slowly spin into the heater and pass through heater’s heating area to achieve uniform heating effect throughout its body and two walls. Moreover, we have also designed special cooling channels on the heater. With both effects of natural cooling and fan cooling, the heat won’t accumulate on the circulating discs to affect preform’s correct heating effect. 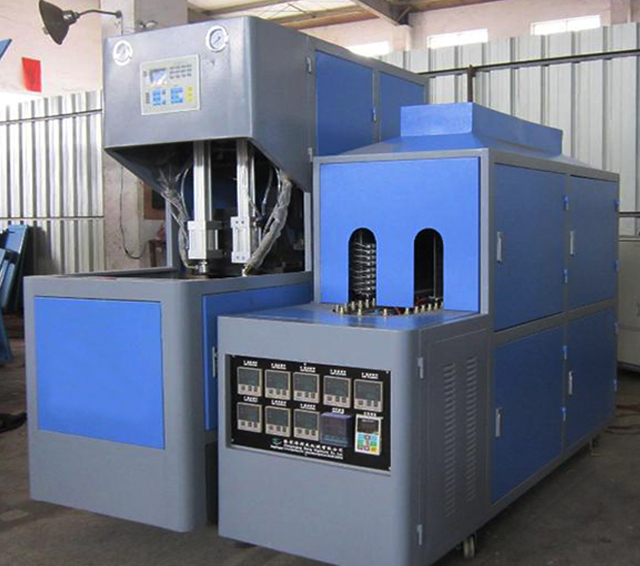 In addition, the circulating discs have several array modes for choice to fit preforms with difference neck size, and can move very smoothly because of the nice cooperation of the preform heating stand-frame’s oriented mechanism. 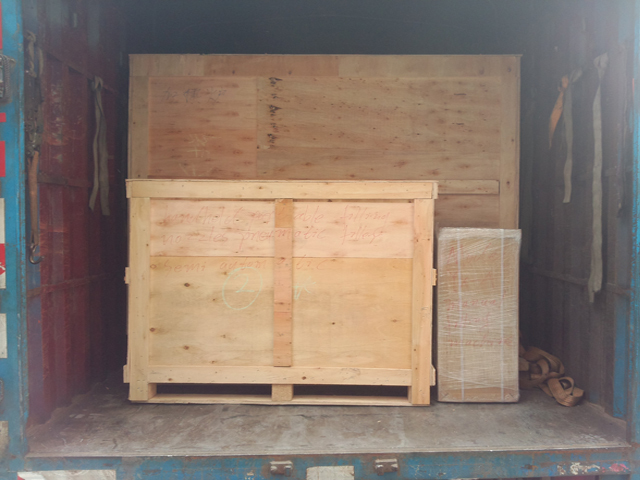 In conclusion, the reheating unit can heat various of preform to produce diversified container. 1) PLC Control System. The full-digital displaying PLC control system control machine’s operation including sealing, stretching, blowing and mold’s moving, and all settings are interfaced through a user-friendly “soft-touch” pad, all data of operation are all shown on its LCD. Such PLC system’s inner elements ae all of only the high quality available, which ensure it to achieve time-control precision to 0.01 second. In addition, such PLC has also data memory function. 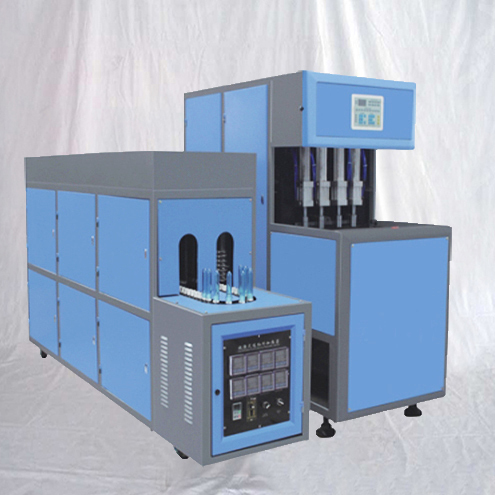 It can store 12 sets of bottle blowing parameters of different blow mold. It is very easy to be operated, and be maintained conveniently. 2) Advanced Preform Heater. The new designed multifunctional far-infrared plastic preform heater adopts automatic rotary heating mode. 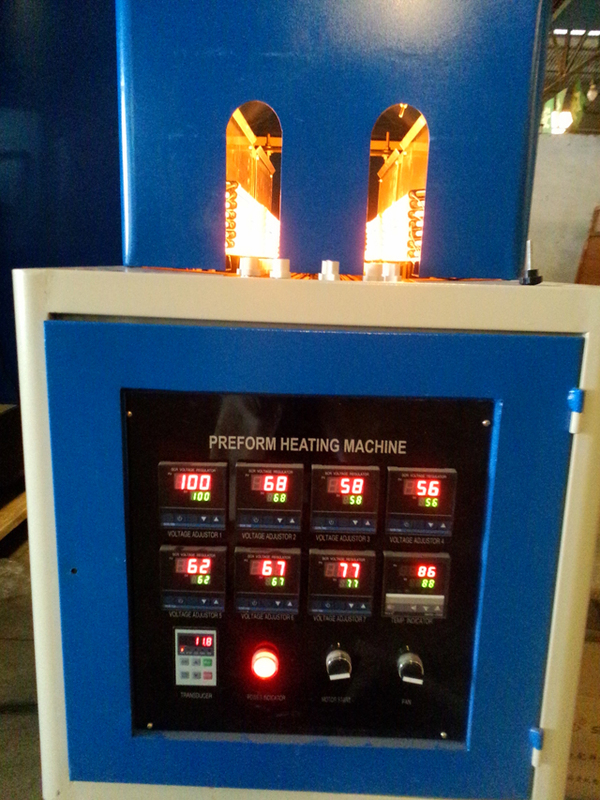 Under this heating mode, you can make the preform heated evenly, and achieve high qualified-rate of product. It is suitable for heating many kinds of preform with different size and model. 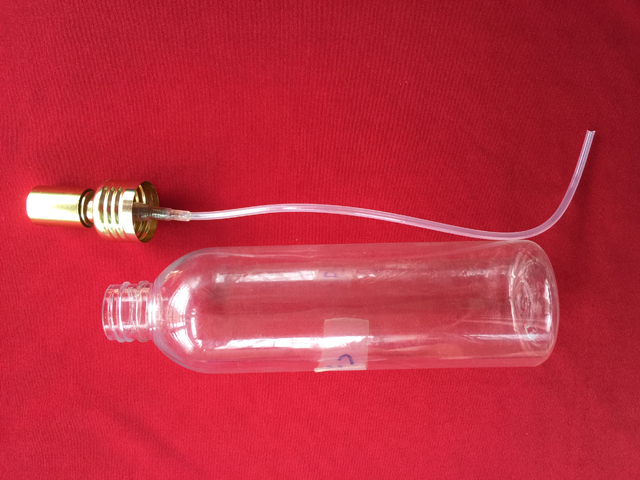 3) Two-in-one Cylinder Set. The stretch cylinder and the mouth-sealed cylinder are designed in one set, which can avoid gas leakage thoroughly and enhance the qualified-rate of product greatly. The speed of releasing each side levers can be freely regulated. 4) Mold Clamping Set. The machine adopts advanced mold clamping set. In the set, there are several mold-closed stands on the mold clamping plate. 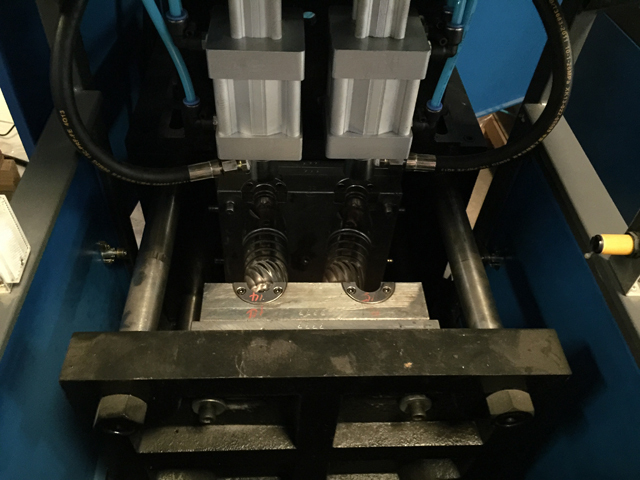 These stands increase the force of closing mold, protect the mold, warrant the quality of product, and make the mold plate sustain force evenly. 5) Import Fittings. 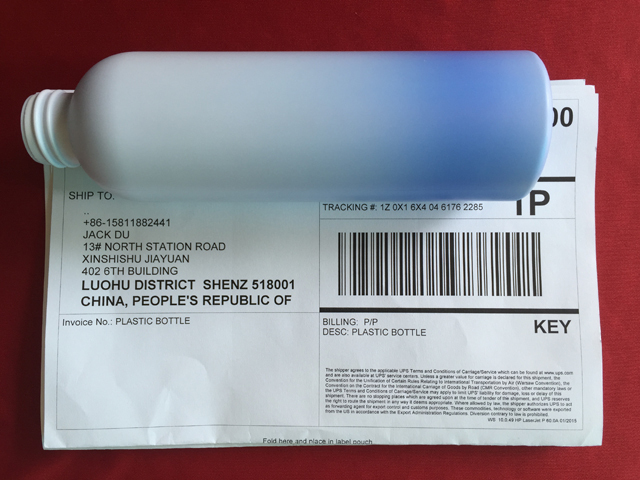 The rubber pipe and connection made in Taiwan avoid gas leakage thoroughly. 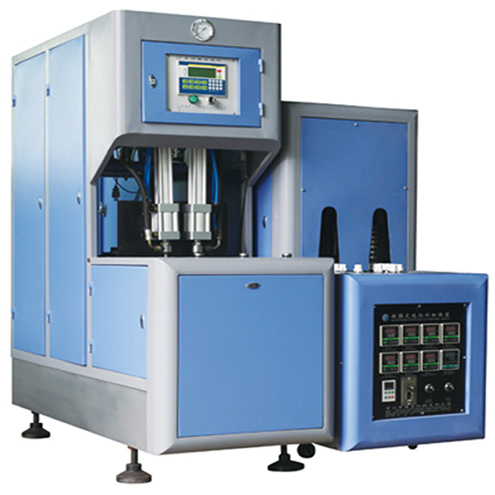 The machine’s pneumatic elements, including electromagnetic valve, oil-sprayer, pressure regulator and filter, are manufactured by Taiwan using the newest technique. 6) Air-stored Set. The machine installs a compressed air-stored tank. 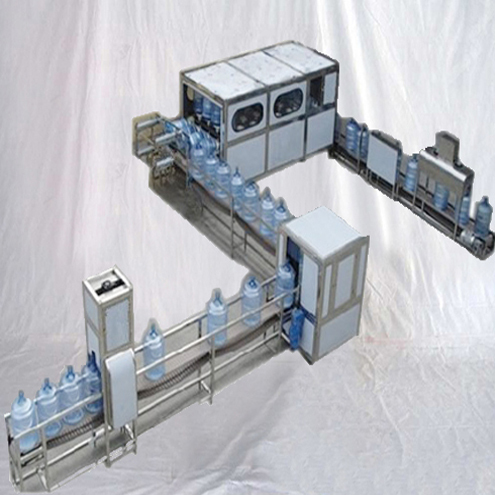 When blowing big bottles, the machine can keep stable pressure, achieve clear bottle shape and enhance the qualified-rate of product greatly. 7) Automatic Draining Set. The machine can eliminate water and marks, emerging under high temperature and high pressure, to make product more transparent and clear. 8) Protection Set. 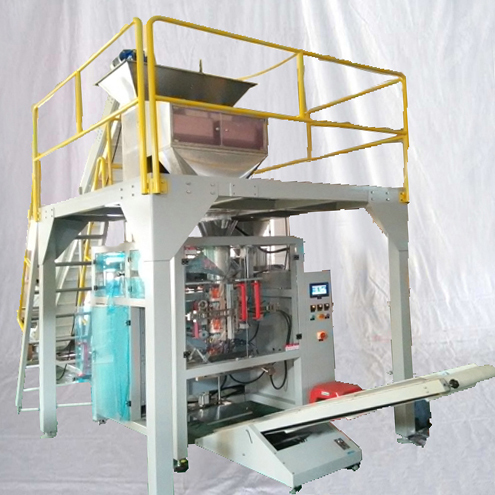 The machine has a twin switch on set, which not only protects the mold, but also guaranties the operators’ safe. 1) This unit is made up of mechanical part and electrical part, and equipped with control box. It is characterized of its mature heating technics, high efficient heating effect and convenient operation and maintenance. 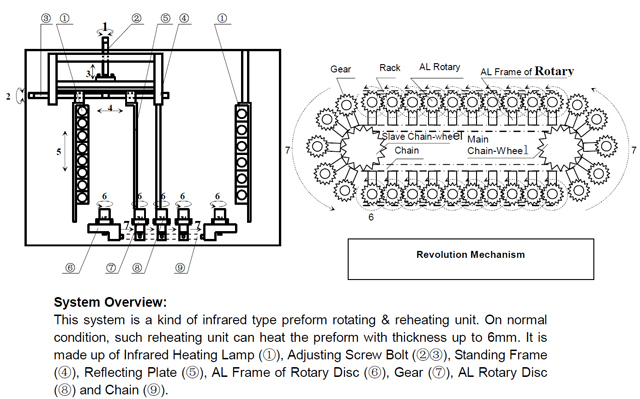 2) Its circulating move unit is made up of Main Chain-wheel, Slave Chain-wheel and Chain with cabinet volume. 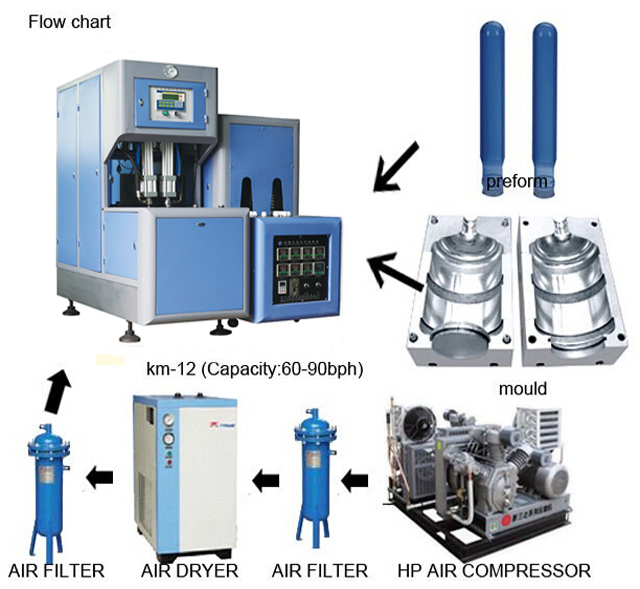 The whole transmission channel is divided into Heating Channels and Cooling Channels with reasonable distribution and reliable running. 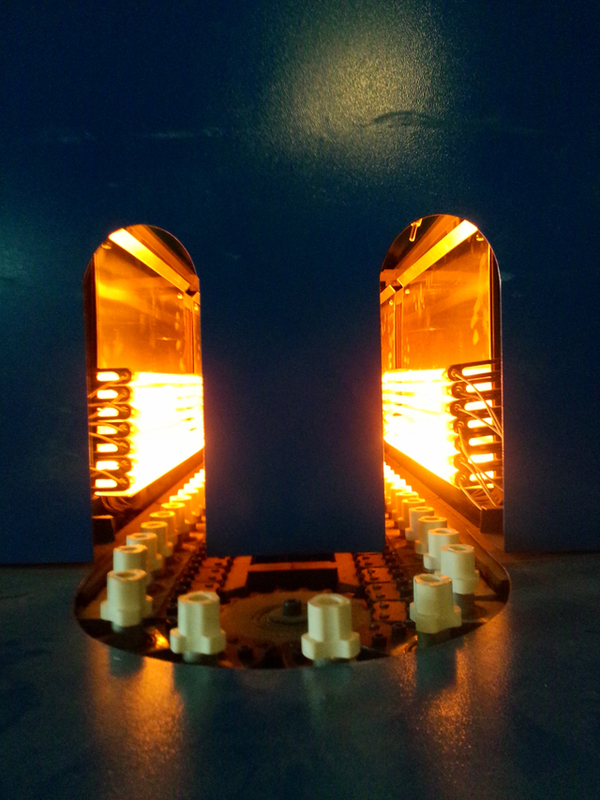 3) This heater adopts far infrared heating lamp to reheat preform. There are 18 heating lamps in all, which are divided into three groups. According to concrete specification of preform, these heating lamps can be used partly or all together. 4) During moving ahead, the rack will make the circulating discs rotate, which can make the preform be heated uniformly and ensure to achieve nice stretch-blow effect. 5) Under preform stand-frame’s long-side and short-side, there are roller, oriented track and oriented bar, which clamp correspondingly and make transmission smooth. 6) On cooling channels, besides natural cooling, there is fan cooling, which can quicken cooling speed to avoid accumulating heat on circulating discs. With both natural cooling and fan cooling, the heater will ensure the preform to achieve nice heating effect. 7) The control box will carry out all working electrical equipments’ switch & change control and adjustment, very convenient.